Product Detail Summary: Enter a Universe where man and beast now join forces to save the fate of the universe! 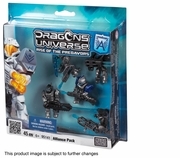 Maintain peace and prosperity throughout the galaxy, by building your Alliance forces to defend from the Predavors with the Alliance Fig Pack by Mega Bloks! Join the combat genius General Primus Justus, the adventurous Sergeant Postumus, the valiant Sergeant Carbo and Privates Triferus and Tasius as they fight the Predavors in your exciting missions to protect the universe!